We've done a wee release to fix a few of the pressing firmware issues. PCLink hasn't changed so the release notes below will be for the previous release. Fixed bug where users updating from 5.6.2 to 5.6.5 were required to enter a factory unlock code. Add CAN frames to Audi TT mode to support later models. DI 3 & 4 pullups now remain enabled after power cycle on Monsoon. 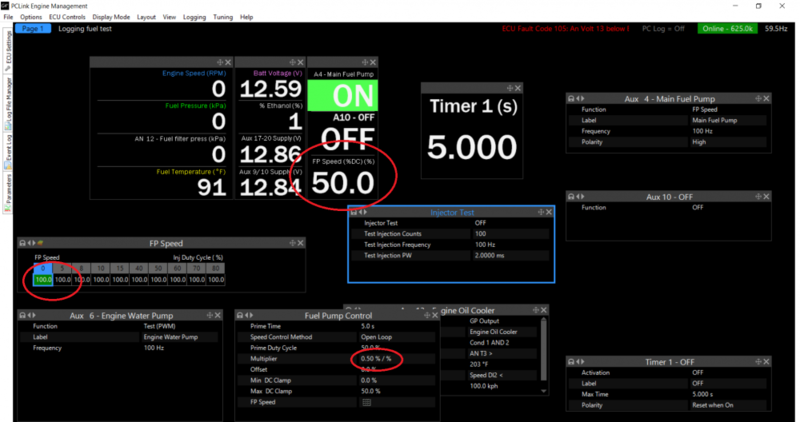 VVT PID gains no longer lost on power cycle when PID Setup is set to Custom. 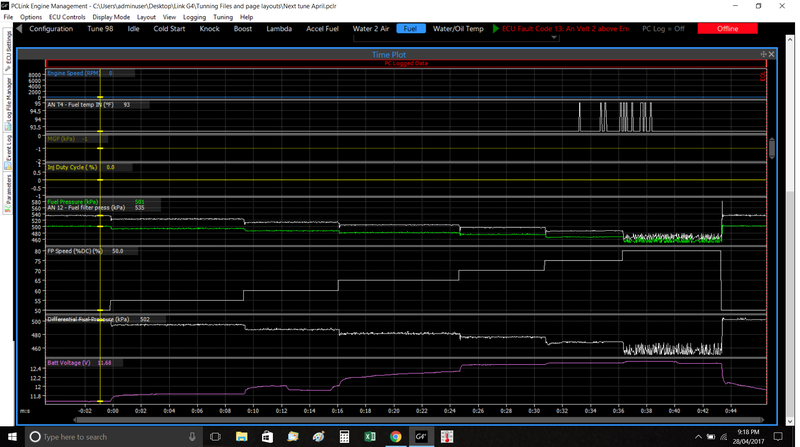 Fixed Overrun Fuel Cut going to 100% duty cycle in Multipoint Group Mode (broken since 5.6.5.3303). 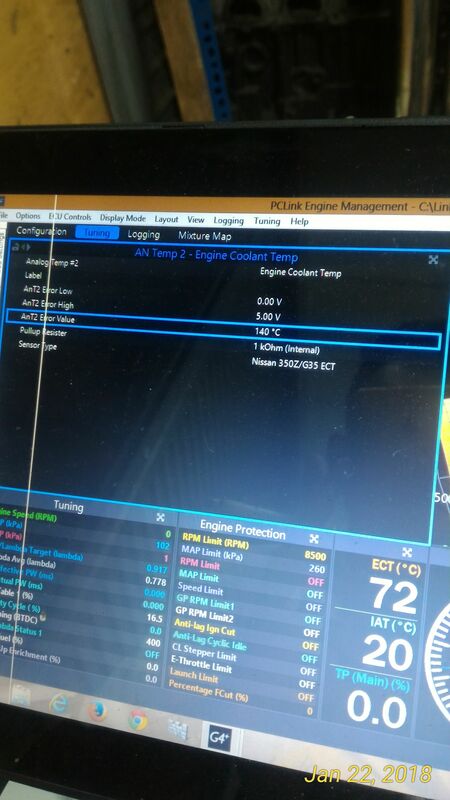 Injection pulse no longer goes to zero if overlay fuel table is activated. Staged injection now fires secondary injectors when sequential primaries and group secondaries are selected. GDI HPFP no starts pumping when under pressure fault exists (broken since 5.6.5.3303). Post here if you find any issues. Hi Dave can you please have a look at the FP speed DC% during logging. Not sure if its normal but when you change the multiplier in the fuel pump control tab the FP speed DC% during logging does not match the duty cycle in the FP speed table. 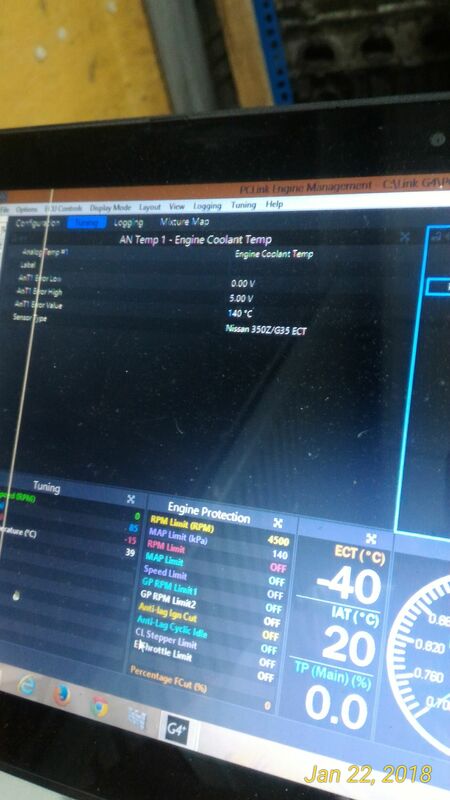 Im using a NZEFI hardware PWM fuel Controller and they are the settings with the instructions. 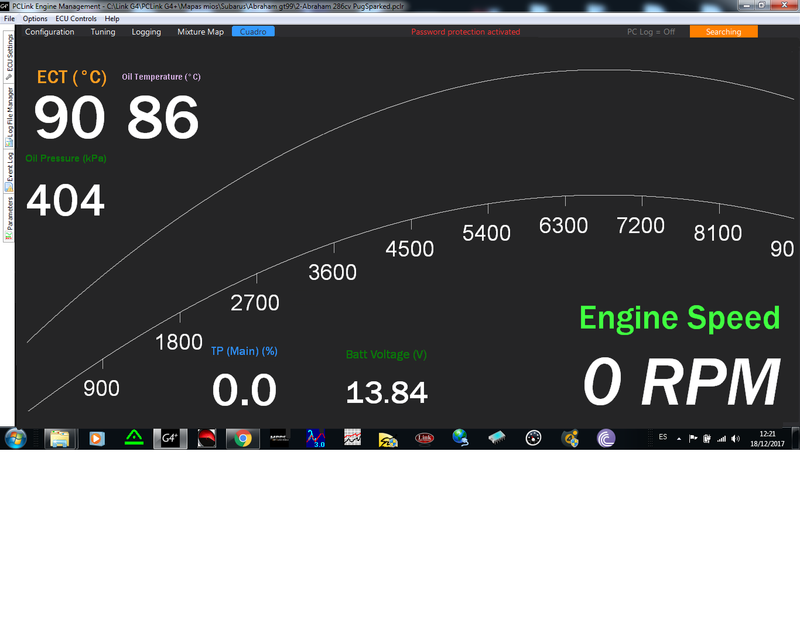 Everything seems to be working here, 100% in the table, Multiplier set to 0.5 I get FP Speed 50% which is expected. Obviously you wont be able to get over 50% as your Max DC Clamp is set to 50%. Would you like to fire a basemap through to tech@linkecu.com? Ill email it to you now. My fuel flow increases if i set the FP speed above 50% as the fuel pressure rises. I think what is happening here is its working backwards to what you expect. i.e. 100% - 62.5 = 37.5%. I think this is because you have your aux 4 polarity set to "high". Does it work as expected if you set polarity to low? Yeah i was expecting it to work the other way. Its a little confusing looking at the logs and the DC% goes up. I was measuring the weight of fuel out of the regulator at different pump DC% to see if my pump was big enough. 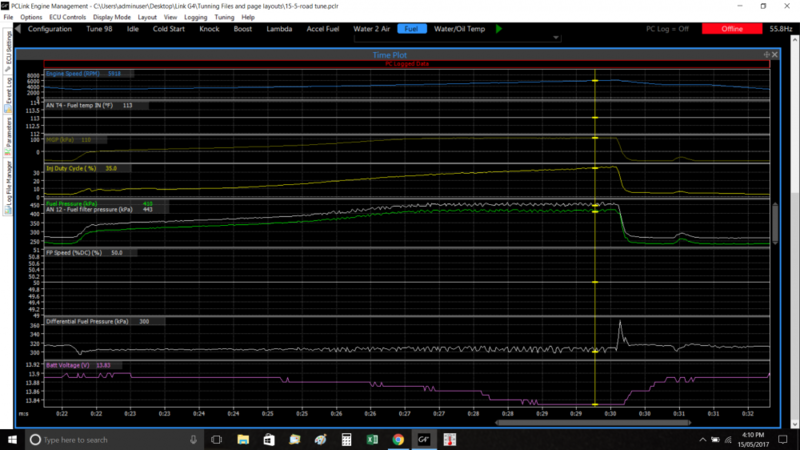 Spent the last few weeks measuring pump and injector flow data. Love the injector test function BTW. There's a bug there too but nothing pulling the plug didn't fix. The DC% goes down from 50% when i change the polarity to low BUT the PWM module does not work like when set to high. If that's the normal so be it. Hey guys, Any chance we could get Closed Loop PID on Walter's kit? This unit uses a MLX16201 "smart" relay controller, signal from ecu, 60 to 330 Hz with open collector low side drive, 0 to 50% duty is 0 to 100% pump duty. Hi dp_tech, I'm not sure if this is a question or a statement? This thread was really for users to post problems related to the latest firmware, are you having some problem? Any chance you have one of Walters PWM controllers for testing? 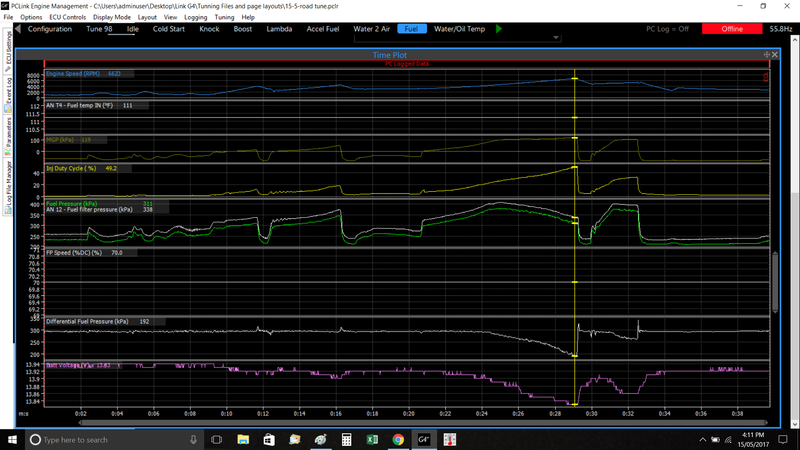 For some reason if i set the FP speed value to below 100 at low pulse widths, say 70 then increase it to 100 above 8%INJ DC the differential fuel pressure drops under boost. But if i set it too 100, differential fuel pressure is close to a flat line at 300 kpa Any idea where i should be looking. I tested this at both 14V and 16V to the pump. Assuming you are using a 2D table make sure you have all cells filled in. There looks to be an issue where if the table is not totally filled in the ECU will only use the first cell value. Thanks Simon. I'll try that on next days off. I have been experiencing similar behaviour to this, but without the controller in question, my controller is built into the fuelab pump. I haven't tried enough different variants to draw a conclusion yet however. If your using the the FP speed table make sure you use all 14 Cells even if you don't need them. As advised by Simon. Works well after that. If this is the case, and not all 14 are used, what happens? 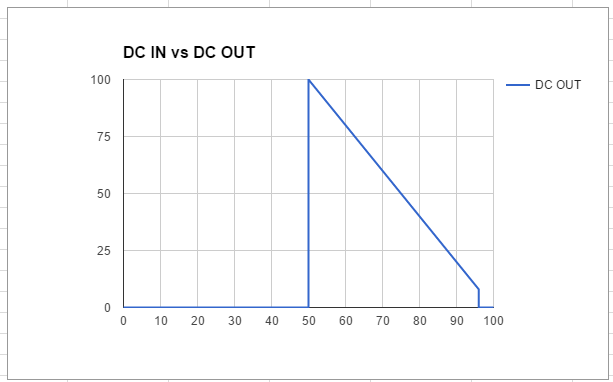 Logging still show the DC % changing, but the change doesn't actually make it to the output? It will only use the value of the first cell even tho the logging shows different. It's been a long time since the last firmware update.. Are we getting something soon with maybe some of the requested features? Firmware is still some time off, I suspect early next year. There will likely be a PC Link update before then. Hi, to use the Link software as Dash in the next update you could remove the outer frames of the watches and always be in front. That and a few other handy features are already on my list of "Things that would make PCLink much nicer to use as a tablet dash". I just install latest version software tonight because want to start up Monsoon ECU I bought for my customer. May I know why latest software don't have resistor pullup function like previous software? Hi All AnTemp inputs on the Atom and Monsoon have internal 1Kohm pull-up's in hardware which you cannot switch off in software. All ECU's Storm and above have configurable pull-up resistors. You can select a Cal table from the Sensor type to input your own calibration if none of the defined ones meet your needs. The only issue is when you try and piggy back then you need to use an AnVolt input.